I love Halloween. Of all the holidays, it ranks up there as one of my absolute favorites, although my appreciation of it has changed over the years, from the free candy one was sure to recieve with a good enough costume through to today, where I've come to really enjoy after taking an English course on Gothic literature and gaining an appreciation for the darker elements of the day and horror in general. As a geeky person (and member of the 501st), there's the added element that seems to really appeal to this social group in which they are able to celebration their interests in a time that it's socially acceptable by dressing up as their favorite movie characters. It wasn't until this morning that I really began to wonder just how it came to be that you could have small packs of children, dressed as goblins, witches and power rangers, pounding on doors, demanding candy and wrecking havoc throughout the neighborhood. I came across a set of photographs on Wired Magazine's webpage, of Halloween costumes from the 1940s, prompting a line of thought that made me wonder about America's history with this holiday, and what it meant. Halloween is commonly connected to things such as witches, fairies, devils and other devilish creations that give the night something of a sinister edge. Interestingly, this is not too far off from the original reasons for the celebrations that gave basis of the holiday. The earliest connections to the modern holiday is the celebration of a Celtic day called Samhain, the New Year in the calendar and was traditionally linked to agriculture, given the time of the season. Few records exist for how the holiday was celebrated, and by the 9th through 12th centuries, Christianity was becoming a dominant force in Europe, and as this gained far more importance and power, local traditions were folded into the religion. This is similar to what happened with Easter and Christmas, with Christianity pulling elements of local traditions and essentially updating them in ways that would allow the locals to better accept this new religion without too much fuss. There are still links to the agricultural nature of the day through to the present day. Houses are decorated with pumpkins and corn stalks, which connects the two somewhat. Carved Pumpkins further connect the day to evil or dead spirits via a story of Jack the Blacksmith, who was banished from both heaven and hell and forced to wander the earth. 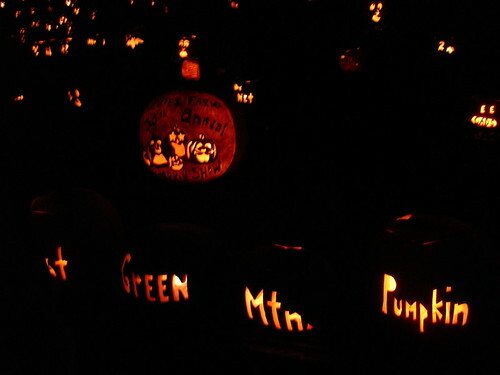 To light his way, he used glowing coals in a vegetable that he was eating (4), giving us the modern day jack-o'-lantern. Elements such as witches, also with links to ancient religions and branded as evil by Christianity, have also been associated with the day. Halloween in America has been celebrated for a long time, since the colonies in the 1600s, where it was likewise an agricultural holiday. The Salem Witch trials of 1692 only added to some of the elements that are celebrated in the modern day. With Irish Immigration during the 1800s, the holiday was further reinforced. (5) It was also during this time and the early 1900s, that the holiday began, along with others such as Mother's Day, Christmas and Thanksgiving, to be commercialized in an effort on the part of businesses to increase profits. (6) While looking over pictures of the 1940s costumes, it would seem that this commercialization was probably pretty low key compare to what the holiday is today. According to Wikipedia, the practice of trick-or-treating didn't come into widespread practice until around the 1950s (7), which would place it firmly within the time of a boom of commercialism in the United States following the 2nd World War. Undoubtedly, the growth of the holiday has been helped along by the growth of the middle class and the consumer culture that has gone along with it. With the introduction of the block-buster movie season in the 1970s, costuming would have most likely become much more popular, especially with children and young adults, who would use the holiday as an opportunity to dress up as their favorite movie characters. Unsurprisingly, in recent years, there is quite a bit of business in creating Halloween costumes and candy through to today. I remember Halloween with quite a bit of nostalgia. Among some of the costumes that I've donned over the years is Batman (probably my first), an American Indian, Luke Skywalker (Return of the Jedi) and obviously recently, a Storm Trooper. Growing up in a small town, there was always a bit of excitement for the event, to walk up and down Rt. 100 with a group of friends until we were tired from walking back and forth. We rarely had people come to our house because we lived several miles away from town in a very sparcely populated area, but we would put out pumpkins and a plastic ghost. I can't remember when I stopped trick or treating, and I know that I didn't dress up last year for it, or at all when I was in college, although I did help out with the Haunted Hay ride fundraiser that Norwich would sponsor every year with the town of Northfield. By far, the best display of the season will be at Ellies Farm and Market, which boasts hundreds (I believe 700 this year) of lit pumpkins in the forest. Looking over the costumes that I saw this year at the parade in Woburn or on Church Street or at the Spirit of the Tower event that I attended in armor, it's fairly clear that Halloween has become a sort of celebration of popular culture, especially when it comes to science fiction and fantasy, as these genres seem to have really become popular in the past couple of years. Certainly, there's plenty of films to choose from when it comes to costumes, and this translates, as the most popular costume that I saw this year was Batman and Captain Rex, characters from The Dark Knight and The Clone Wars, but numerous other movie costumes were present. For me, the holiday will always be one of nostalgia and geekiness, which is how I like it.